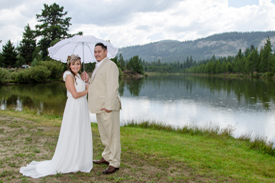 One of the most affordable yet charming and serene venues in the South Lake Tahoe area is Tahoe Paradise Park. With only a marginal wedding budget this secluded park is obtainable to those desiring to host their ceremony and reception at one reasonably priced location, and the amenities this venue delivers rival other higher priced comparable wedding sites. Situated near the banks of the Truckee River alongside Lake Baron in the township of Meyers, California, the park is considered a diamond in the rough only because it is hidden away among the Sierras in a small, relatively unknown mountain town just outside the city limits of South Lake Tahoe. Aspiring marriage contenders are joyfully pleased when first introduced to the site’s exquisite surroundings. The beauty abounds in panoramic vision, making the walk down the aisle of matrimony one of extraordinary caliber. 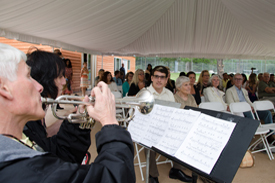 Two options for where the ceremony can take place are either at the gazebo’s front or next to the aged cedar tree with both spots having room for up to 150 guests. The nearby rec hall that doubles as a reception facility is an expedient short jaunt away, an appealing benefit contributing to the venue’s desirability. Another factor adding to its attractiveness is that, for a comparatively low-cost rental fee, you can celebrate your new marriage at your own pace without worry of time limitations because when you reserve the hall, you are granted sufficient time to progress through all of the customary soiree events. In contrast to other similar reception facilities where time constraints could be a concern, you can enjoy the banquet celebration for an extended period. The inside space of the hall can comfortably seat approximately 50 guests, but when you secure a reservation the outer patio region is part of the deal, which can easily accommodate up to an additional 100 or more attendees. The included small kitchenette is convenient for preparing meals for the feast or storing items brought in by your chosen caterer. 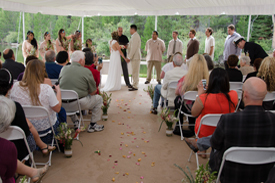 Attaining a wedding ceremony venue and reception facility where both event sites are conveniently situated at the same location and at a cost that’s relatively inexpensive is a tremendous indulgence, especially if the venue comprises enviable assets such as a reception facility enjoying indoor and outdoor accessibility and an alfresco ceremony setting surrounded by the aura of nearby Lake Tahoe and the beautiful Sierra Nevada Mountain Range. Tahoe Paradise Park possesses all these characteristics and a few more, and with such copious niceties in a picturesque, spellbinding locale dispensed by the largest alpine lake in North America, it may be inequitable to refer to this wedding site as a diamond in the rough, but instead, perchance more accurately, a polished hidden gem. 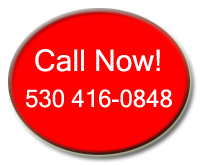 If you’d like additional information or details about the wedding facilities at Tahoe Paradise Park located in Meyers, California, please visit our website. This entry was posted in Various Wedding Venues. Bookmark the permalink.